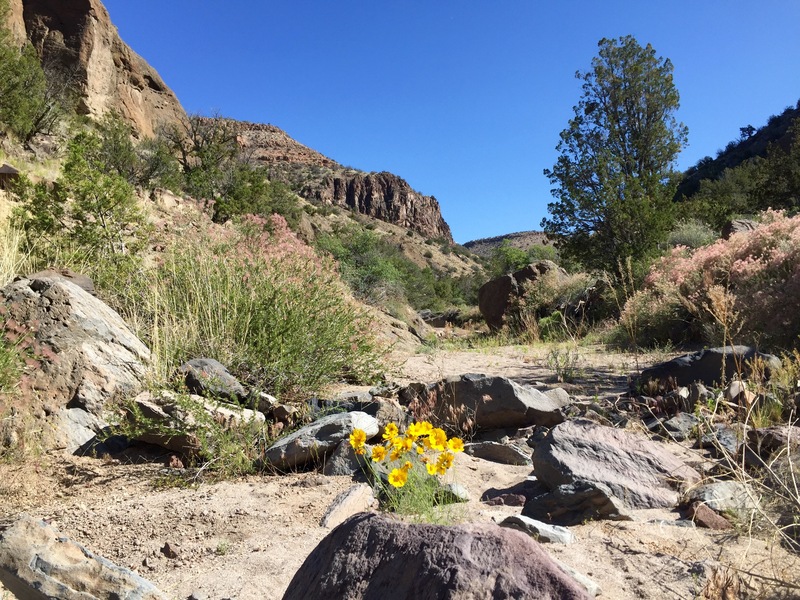 After pulling myself from the throes of the Rio Grande, I tiptoed around prickly pear and cholla,following a faint cairned trail to Alamo Canyon. 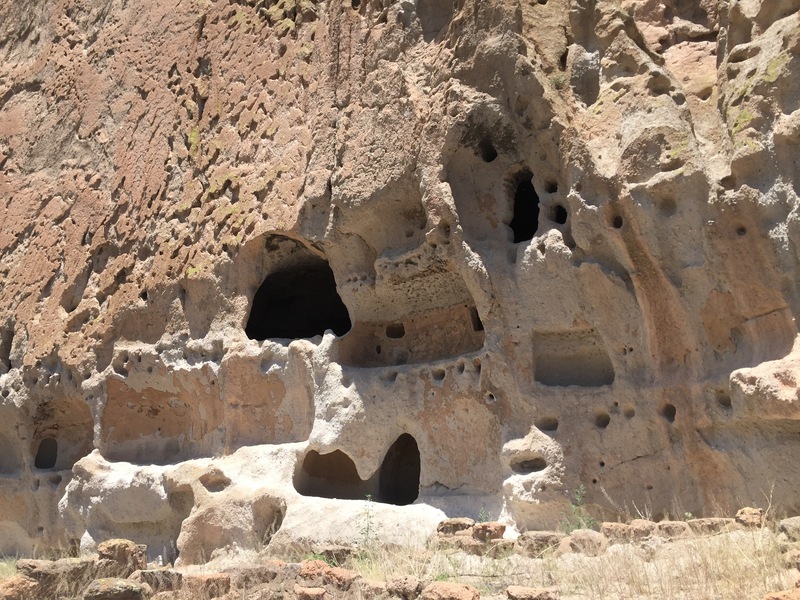 This route led me to the Bandelier National Monument; 11,000 year old Ancient Puebloan homes carved in volcanic tuft. If you take this route, you can eat a turkey sandwich at the snack bar and watch big buses puke pale puffy tourists with fanny packs. But! 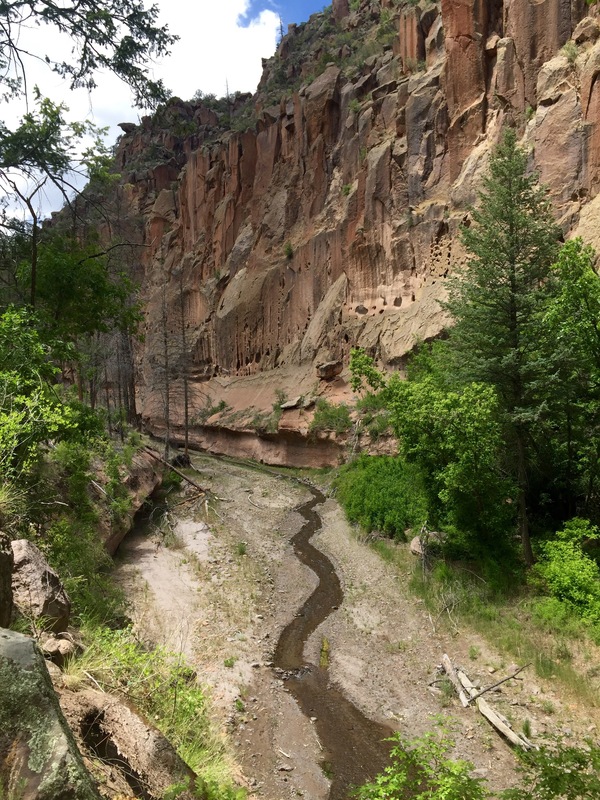 Once you hike passed the monument down Frijoles Canyon, it’s all yours. A 2011 fire,and subsequent flooding,turned the canyon into a “hard” hike, so expect to climb over and under several log jams and navigate rough tread. It’s quite similar to hiking a canyon in Utah. Nice photos, keep them coming. It’s gotta be hot but it sure is beautiful though. It’s a little warm here in Bellingham actually. Thanks for the photos. Awe Bellingham! I heard Portland was 106 the other day! I heard that you were behind me on the GET from my friend Heidi Blankenship (BLM Ranger @ Aravaipa) & Neon. Believe it or not, I planned to hike the GET, the NNM LOOP & the GDT this year as well, but skipped the NNM LOOP so that I could help my friend Raven get ready for her PCT thru-hike!!! I’m in Moab right now living in an awesome sandstone cave outside of town. A couple years ago I got marooned here in Moab during my first attempt on the Hayduke (my hiking partner Funnybone was missing maps so I bailed) & wandered up a canyon & ran into the legendary character Daniel Suelo (“The man who quit money” by Mark Sundeen). Daniel set me up in the most beautiful cave ever with waterfalls & swimming holes nearby & I have been visiting this spot between hikes for the last three years. I’m heading up to Glacier on July 5th – right after the fireworks display here in Moab on the 4th – to walk the Highline Trail up to Waterton to start the GDT. You’re welcome to come on down to Moab after you return to Sante Fe & hang out with fellow Hiker TRASH until the GDT. There’s plenty of room, including a cave called ‘Raven’s Roost’ – named after my friend Raven, who was part of Daniel’s Moneyless Tribe in ’14. Neon would love to see you too! Yes, we met in Cascade Locks in ’10 @ the Best Western Lobby… BTW, Cro kinda reminds me of Weird Al Yankovic (who lives outside of Hana, Maui – where I ‘squat’/stealth camp in the middle of winter). 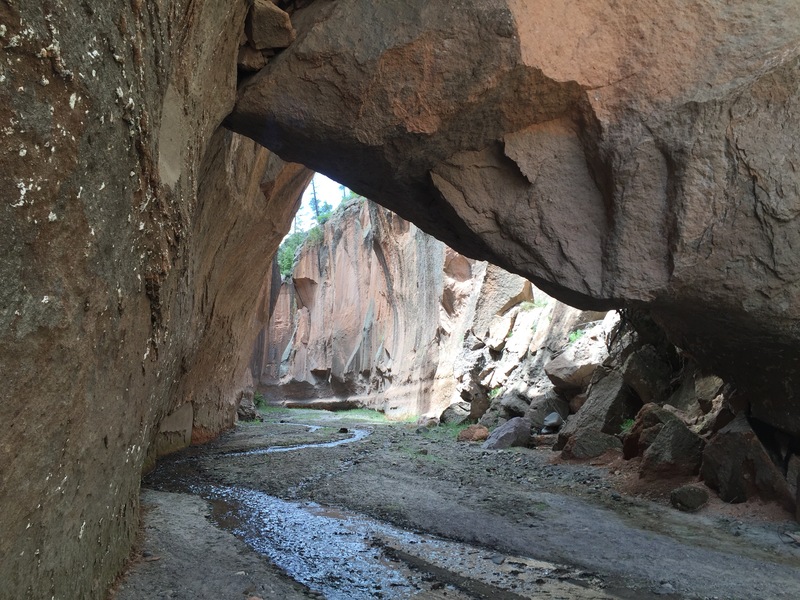 Anyways, there’s plenty of room in the caves & the beauty is sublime (think deep sandstone canyon with perennial spring water cascades, mulberry, peach and apricot trees & one of the most impressive arches on Earth), BUT… its getting a tad bit warm this week (up to 110’!) so I’m heading up into the nearby La Sal mountains for a week of fun in the snow and alpine meadows. Keep in touch – you should have my email. PPS There is a good, cheap ($59 to/from Salt Lake; $79 to/from Denver) airline that now services the dinky Moab airport: Boutique Air. I heard that you were behind me on the GET from Heidi (Ranger @ Aravaipa). I’m in Moab right now hanging out in an awesome sandstone cave outside of town. I’m heading up to GNP on July 5th to hike the GDT. If you have time after your NNM Loop, come on down to Moab to hang out with fellow hiker trash!